Kyrgyzstan: Can Hunting Reform Stop Tourist Scams? 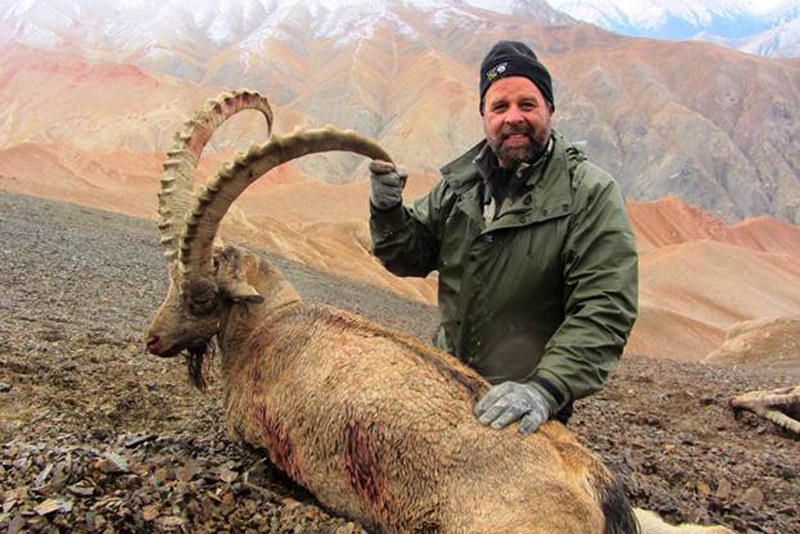 Two years ago, Steve Presnal’s dream came true when he embarked on a hunt for Siberian ibex in Kyrgyzstan’s Tian Shan Mountains. With two friends, the 49-year-old from the US state of Wisconsin had booked a trip through an international agent who set them up with a Karakol-based hunting guide. But that guide got the three arrested. “The hunt itself couldn’t have gone better. Each of us shot a perfect trophy ibex. But as soon as we were back at the camp, the trouble started,” Presnal said. Their guide, despite his assurances, had no permission to lead a hunt in the region. The problem, say Kyrgyz officials eager to harness the revenues from adventure hunting, is the opaque way the business is regulated. The process breads scams, encourages poaching, and does little to protect threatened species. Each year, the Hunting Department at Kyrgyzstan’s State Agency for Environmental Protection and Forestry establishes quotas for hunting permits proportional to game numbers in each of 74 hunting territories that cover about 70 percent of Kyrgyzstan’s territory. In 2012, the department established quotas allowing for 400 ibex permits and 70 Marco Polo sheep permits. Hunting outfitters obtained the permits for $720 per ibex and $5,000 per Marco Polo sheep – the most popular trophy animals in Kyrgyzstan – for designated areas assigned to them by local authorities. The outfitters, who sometimes also serve as guides, then charged up to $6,000 for an ibex hunting expedition, and $25,000 to stalk Marco Polo sheep. Due to low numbers of fauna, Presnal’s outfitter was not awarded permits in his territory in 2012. But he took Presnal and his friends hunting anyway. Many suspect the process of distributing lands is riddled with corruption. The outfitters are supposed to manage the land, use hunting revenues to police their territories for poachers, and help conserve the big game that makes the land so valuable in the first place. “Some areas are clearly overhunted due to bad wildlife management and poaching,” said Askar Davletbakov, a senior member of Kyrgyzstan’s National Academy of Sciences who organizes wildlife counts each year. A new law is designed to reform the system of permits and land distribution. Under the law, which comes into force next month, 52 hunting territories will be redistributed under stricter conditions, smaller territories will be merged, and 8 million hectares of government territory will be privatized. “Quality over quantity, a more manageable number of territories, will help improve management,” said Almaz Musaev, deputy director of the State Agency’s Hunting Department, who assisted in drafting the new legislation. For the first time, outfitters applying to manage hunting territories will have to submit business plans outlining their wildlife management strategy. Moreover, they will not automatically receive plots for 10 years. Musaev says his office wants the territories to run like businesses that reinvest money, rather than just take profits. “Profits from guided hunting tours will flow into increasing wildlife numbers,” Musaev told EurasiaNet.org. This includes, for example, investing in monitoring, disease prevention and efforts to avoid pasture conflict with herders. Outfitters must also supply security to prevent poaching on their parcels. Though the Marco Polo sheep is listed as “nearly threatened” by the IUCN Red List of Threatened Species, its horns are popular trophies, and its meat is sold in local markets. Rangers, who currently earn as little as $50 per month, will gain enhanced powers to arrest poachers. They will also receive a 30 percent share of revenue from the newly increased fines. A 2008 report by the United Nations Food and Agriculture Organization (FAO) describes hunting tourism globally as an important tool for nature conservation and socio-economic development in rural areas, that, when properly managed, has minimal impact. But the FAO also warns about “corruption, fraud, overshooting of quotas, bad management, loss of wildlife numbers and biodiversity,” which observers say are major problems in Kyrgyzstan and neighboring countries. While some conservationists would prefer to see a total ban on hunting, such an approach doesn’t seem viable in a country where permission for just about anything can be obtained via a bribe. According to the Hunting Department, each year 700 foreign hunters travel to Kyrgyzstan. Today, because of low wildlife numbers, many go home empty-handed or are led by guides to prohibited areas such as state nature reserves. The tourists are often clueless that they are breaking Kyrgyz law. International middlemen further confuse things, Musaev says, by taking a large cut from the guides, who sometimes refuse to surrender trophies until they’re paid extra. Presnal and his friends were released the day of their arrest, after their guide paid a fine, but they never saw the skins and horns of their three prized ibex. Karakol police told EurasiaNet.org that they had given the trophies back to the outfitter, who promised to mail them to the United States. That never happened, Presnal says. The outfitter, Aska Tur, has disappeared and did not respond to questions posted through its website. The German company that connected Presnal with Aska Tur, Hunting Club Taiga, was not available for comment. International hunting forums are full of complaints like Presnal’s, though there is not much the aggrieved hunters can do to redress their complaints. Despite his troubles, Presnal believes Kyrgyzstan has potential for hunters: “It’s a great country with friendly people and high-quality trophies. I would come back, but only if the government gets the problem with the outfitters under control,” he said. Adriane Lochner is a Bishkek-based journalist.